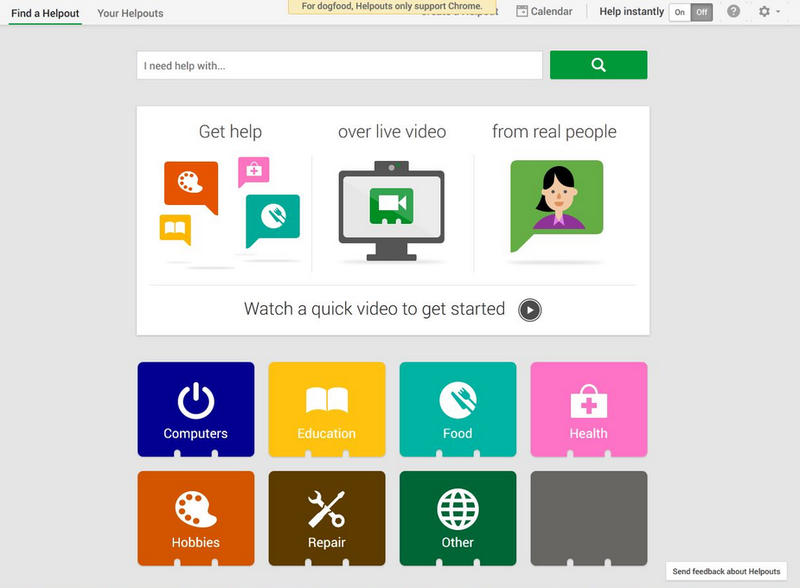 Last month, our own Rip Empson broke the news that Google was working on Helpouts, a Hangouts-based marketplace “that enables individuals and small and large businesses to buy and sell services via live video.” Today, Helpouts made its first public appearance. The service’s homepage is now live, and while it remains invite-only, its help pages are public and give us a closer look at what Helpouts will look like once it launches. The service obviously isn’t available yet, but Google says it is “currently inviting people with expertise across a number of topics to be able to offer Helpouts when we go live — and to make money sharing their skills and knowledge with the world.” Interested experts can already leave their names and email addresses to be included in the beta test. According to the Helpouts Help pages, experts can choose to list their services under Home & Garden, Computers & Electronics, Health & Counseling, Nutrition & Fitness, Fashion & Beauty, Art & Music, Cooking, and Education. Payments will be handled by Google Wallet. In the document a source provided us earlier this year, health services were prominently featured in the screenshots, and judging from the site that went live today, this is still a prominent feature of Helpouts. Google is working with HireRight — a provider of background-screening services — to ensure that the health-care professionals who sign up for Helpouts are vetted.